I just noticed that iLounge.com is offering their readers a free 45 day subscription to Skillfeed so I thought I would pass along the link in case anyone was interested. See their announcement and a link to their site below. 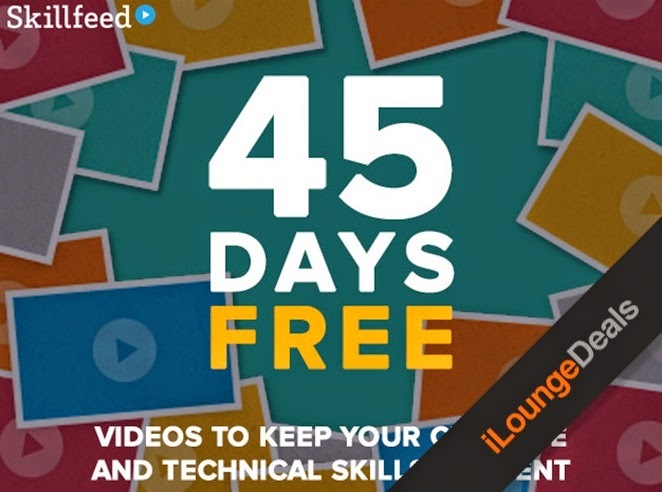 In today’s iLounge Deal we’re offering our readers 45 days of free access to Skillfeed’s online training courses. Normally priced at $19/month, Skillfeed is an educational resource providing e-learning courses in a wide variety of programs including design, photography, coding, and more. One way to try these type of deals out is to set an reminder in Calendar for about 40 days out to remind you to cancel the free trial. An easy way to do that is to press and hold your home button on your iPhone or iPad and tell Siri to remind you to cancel Skillfeed in 40 days. If you enjoy the e-learning courses on Skillfeed you can pay the $19.00 monthly fee and continue on, but if you don’t want to continue you can use the reminder to cancel your trial subscription. Either way you will have a chance to try out the site and learn a new skill or two for free!